White River Provincial Park on northern Vancouver Island is a small, undeveloped wilderness area that offers excellent fishing opportunities and protection for important Roosevelt elk and black bear habitat. This scenic park and its old-growth forest were stunning enough for Hollywood to take notice – portions of White River were used as a film site for the movie The Scarlet Letter, filmed here in 1994. Visitors to the park today will find remnants of the film set, including wide boardwalks designed to accommodate horse-drawn carriages. The park is located on the White River, approximately 25 km south of Sayward and 7 km west of Schoen Lake Provincial Park on northern Vancouver Island. The park is accessed by a gravel logging road off Hwy 19 from Sayward Junction. History: White River Provincial Park was created in 1995 as a result of recommendations made in the Vancouver Island Land Use Plan. The giant conifers at White River Park were showcased in the Hollywood film the Scarlet Letter, which was filmed in the area in 1994. Visitors to the park will find remnants of the film set, including wide boardwalks designed to accommodate horse-drawn carriages. Conservation: In addition to the old-growth Douglas fir and Western red cedar forest, the park protects important Roosevelt elk and black bear habitat. Summer steelhead, coho, rainbow trout and anadromous (fish that spend part of their time in fresh water and part in salt water) Dolly Varden, are all also found in this section of the White River. 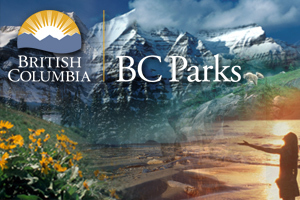 Approved Purpose Statement and Zoning Plan [PDF] for White River Provincial Park is available in pdf format. The White River is a prime recreational area for angling and nature appreciation. Fishing is permitted as per provincial and federal fishing regulations. All anglers should check the current regulations issued by Fisheries and Oceans Canada prior to fishing. Anyone fishing or angling in British Columbia must have an appropriate licence. A short loop trail through the old-growth forest leads down to the White River. This trail is maintained and takes approximately 5 minutes to complete. Visitors will be rewarded with views of some massive Douglas fir and Western red cedar trees on this trail in the park, which has been referred to as the Cathedral Grove of the North Island.